When the sky turns grey and the sun hides behind the clouds, when lightning flaunts its electric white hue and thunder splits our ears, we know what’s coming next. pouring rain! The first thing that strikes our mind at that moment is to rush to the kitchen and make ourselves a cup of hot tea or a bowl of warm soup, to keep us company as we sit in the balcony and watch the torrents come down. 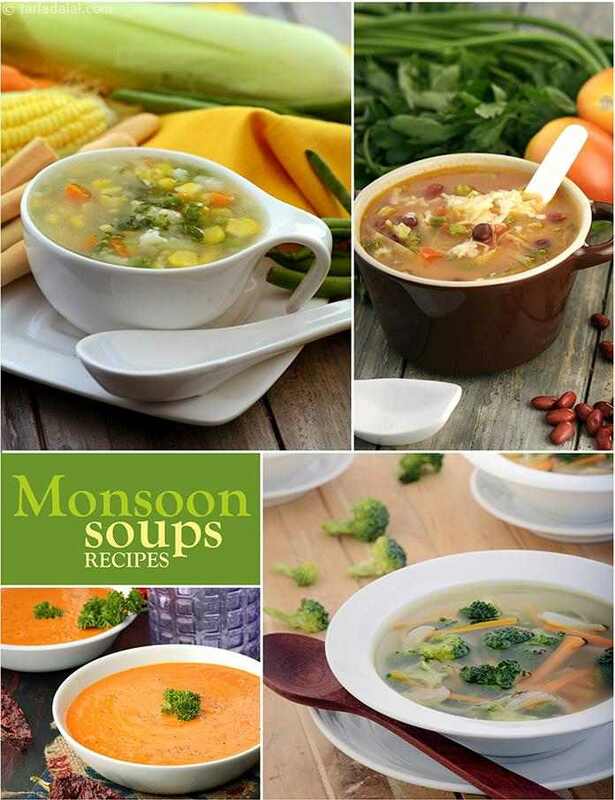 Yes, the monsoon can be fun, if you learn to enjoy it – and a bowl of hot soup is a good place to start, as it can instantly perk up your mood and beat the monsoon blues. So, open the windows and catch a whiff of the wholesome and nourishing soups simmering in the Tarla Dalal Kitchen! Soups like Bombay Curry Soup tickle your tongue, while those like the Noodle, Sprouts and Capsicum Soup pack in a lot of fun, which even kids will love. When you are feeling a bit down, options like the Whey Soup and Nourishing Barley Soup are perfect, as they will comfort and nourish you. An aromatic, healthy and exotic soup - the perfect start to a meal.